The home page of the Indiana Memory Project is your starting place for access to the excellent resources found here. One can search by topic, keyword, advanced search or by collection list. Topics include agriculture, architecture, business, environment, military, daily life and education to name a few. The collections list is a wealth of information in itself. This list shows the various sources one can access through this website. The collection list has links to hundreds of digital collections throughout the state of Indiana. One will find sources from Allen County Public Library, Ball State University, Butler University, Evansville Vanderburgh Library, Indiana Historical Society, Indiana State Library, and so many more. 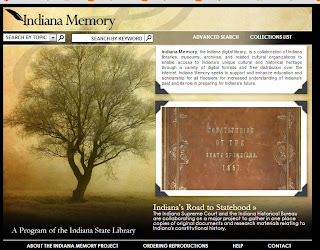 All of the above resources are available through the collections list at Indiana Memory. I have barely touched the surface of what is available at the Indiana Memory Project website. If you have Indiana ancestry the Indiana Memory Project is a must see website. 1Library, Indiana State. "About Indiana Memory." Indiana State Library. Indiana Memory. http://www.in.gov/memories/about.html : 2013. What a great resource! I have LOTS of Indiana ancestors, so ... THANKS! Jenny, you will love looking through this website for your Indiana ancestors. Enjoy!